This session will show how SAP NetWeaver Landscape Virtualization Management software can help customers configure, monitor and manage existing SAP applications (e.g. SAP Business Suite) in virtualized infrastructures, including both public and private clouds. 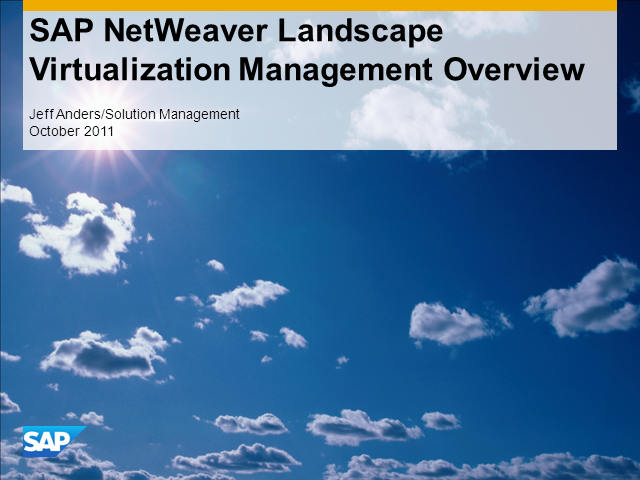 See how SAP NetWeaver Landscape Virtualization Management software connects all of the layers that SAP customers need to manage in their IT landscapes, including both virtual resources and physical machines. Learn how the landscape virtualization management (LVM) software automates key aspects of lifecycle management such as system copy/refresh, and capacity management. See demos of key functionality such as the intersystem dependency framework, landscape visualization, performance monitoring and the built-in task planner. This session will show how IT organizations, and specifically Basis administrators, can reduce the time and effort required to administer SAP systems in virtual and cloud infrastructures.